If you follow the two hours long footpath through the “gorge of the dead” (E4-path goes from Zakros through the Gorge of the Dead, 5.5 km approx.) 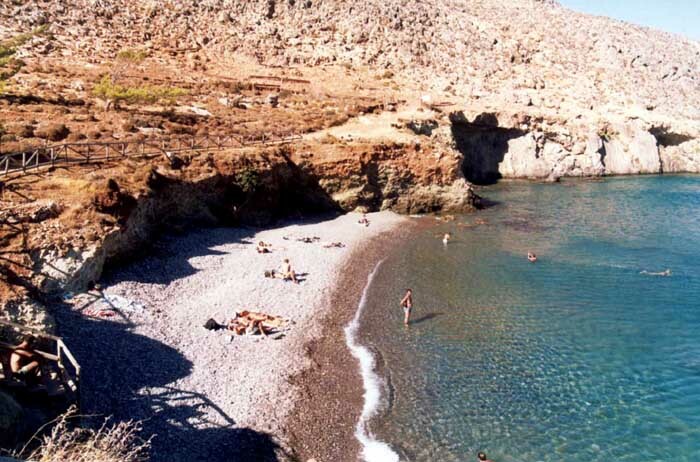 to Kato Zakros where the gorge reaches the coast you will be rewarded with the view of a magnificent beach but also of the Minoan Palace of Zakros destroyed around 1500 B.C. possibly by a Thira (Santorini) volcano explosion. The archaeological site of the Palace of Zakros attracts the only visitors in the area. Palace of Zakros: Open Tuesday to Sunday 18.30 to 15.00 (last entrance at 14.30) for about 2 euros. You can reach Kato Zakros through an hour drive from Sitia or by boat from Vai. There are several taverns on the sea front.